The CSD300 AIS Colour Display Receiver is designed for simple management, control and display of all AIS targets within VHF range. AIS data can be received from all AIS receivers, Class B or Class A transceivers and can be displayed either on a “radar” display, or overlaid on a worldwide background chart. 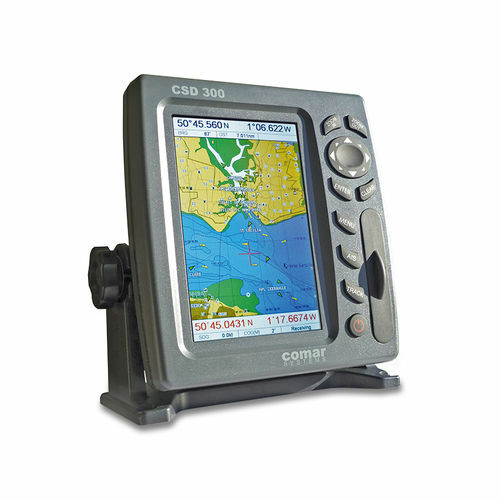 For more detailed cartography, the CSD300 has the facility to take a Jeppesen C-MAP card. The vivid graphics and the simple menu structure on the 6.5 inch, high resolution display make the unit easy to use. The data is easy to access and the information easy to analyse enabling the user to quickly move from screen to screen and gain access to the information specifically required. Allows variable parameters to be set for CPA and TCPA alarms. on each vessel, and instant GOTO function.